Mounts into a panel up to 0.11" thick. Phono socket in a black chrome D-shaped housing. 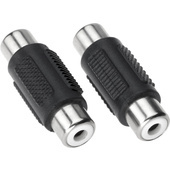 Has a nickel shell for soldered termination of coaxial connections. Heavy-duty RCA plug with a black shell and gold-plated contacts. 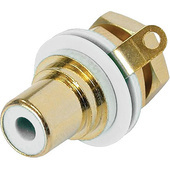 Heavy-duty RCA plug with a black shell and nickel-plated contacts. RCA socket used for audio, composite video and component video.